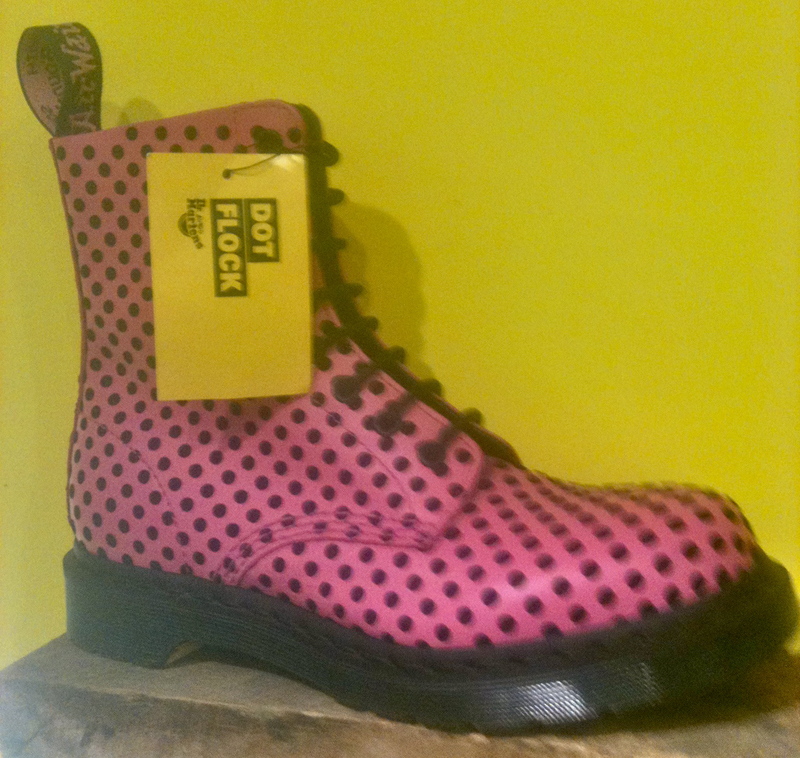 A brief history of Doc Martens: the now-iconic boot was originally the brainchild of German physician Dr. Klaus Marten, who designed them after suffering an ankle injury while skiing in the Alps. Finding the standard-issue army boots of the day too uncomfortable to wear, he set about designing his own modified pair of boots, with softer leather and a cushioned sole. He teamed up with another doctor pal from university and they manufactured the footwear, eventually attracting the attention of British shoe manufacturer R. Griggs Group, who purchased the patent rights for the boots and set about producing them in the United Kingdom. 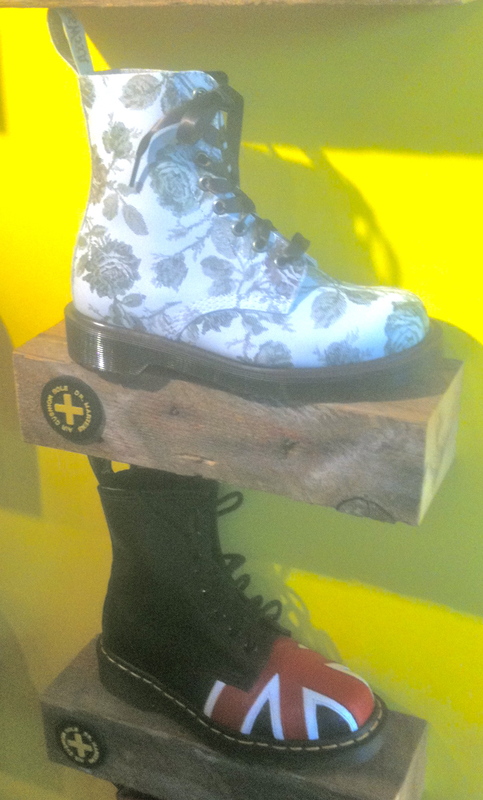 Doc Martens soon gained popularity amongst postal workers, police officers, and factory workers. 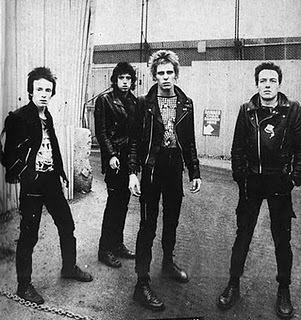 The style was adopted by skinheads in the early ’70s which I suppose makes sense, since they are a tough-looking boot. 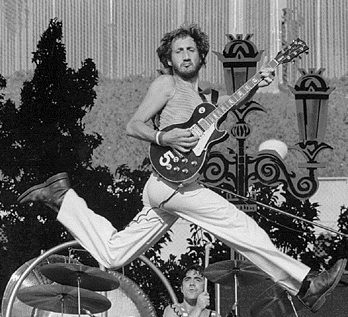 The first musician I can think of who wore them was The Who’s Pete Townshend, and since then they have enjoyed a close relationship with the world of rock ‘n roll, turning up over the years on everyone from Sid Vicious to Joe Strummer to Damon Albarn. 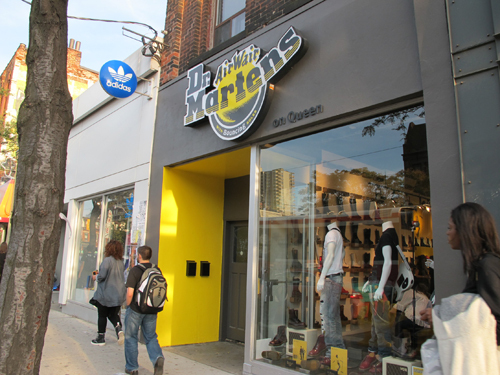 With that in mind, Thinfinn and I hit up the Dr. Martens flagship store on Queen West in Toronto. And holy shizz, dudes. Are there ever a lot of styles nowadays! I had no idea. but was quickly distracted by all of the shiny pretty things in the store. I would so rock these if I could get away with it. Both of these are also pretty rad. 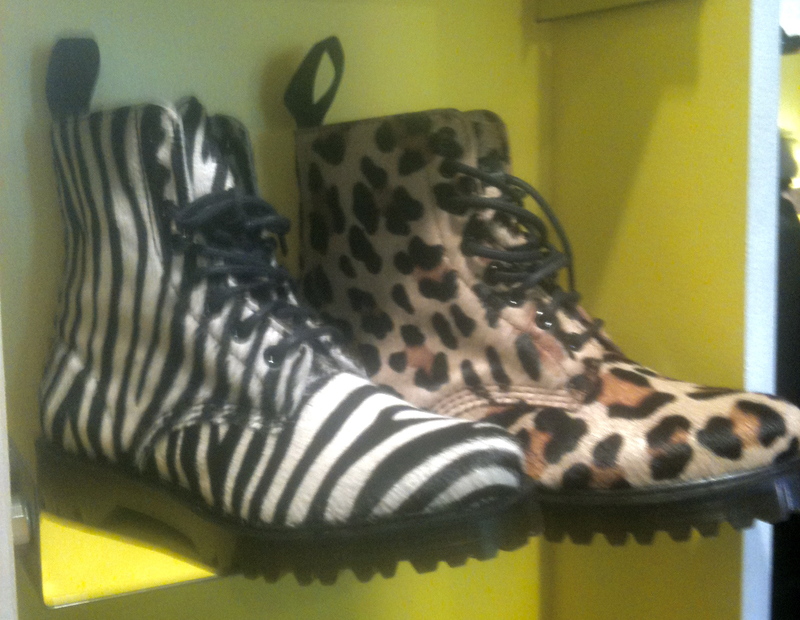 You can’t really go wrong with animal prints in general, and these ones certainly make a statement. 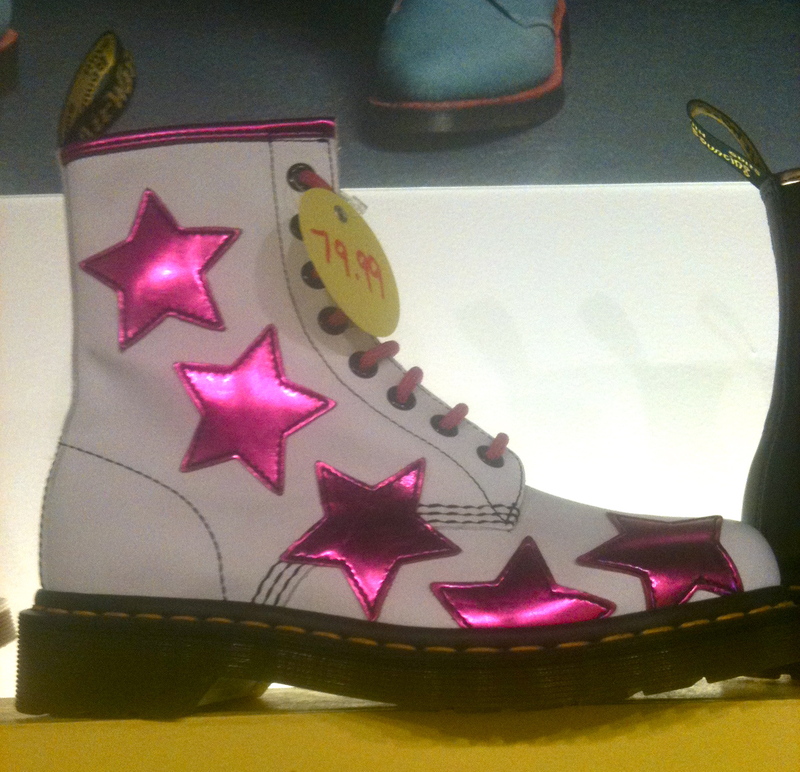 These are okay, but a little too girly for me. Ditto these ones. That’s a bit much. 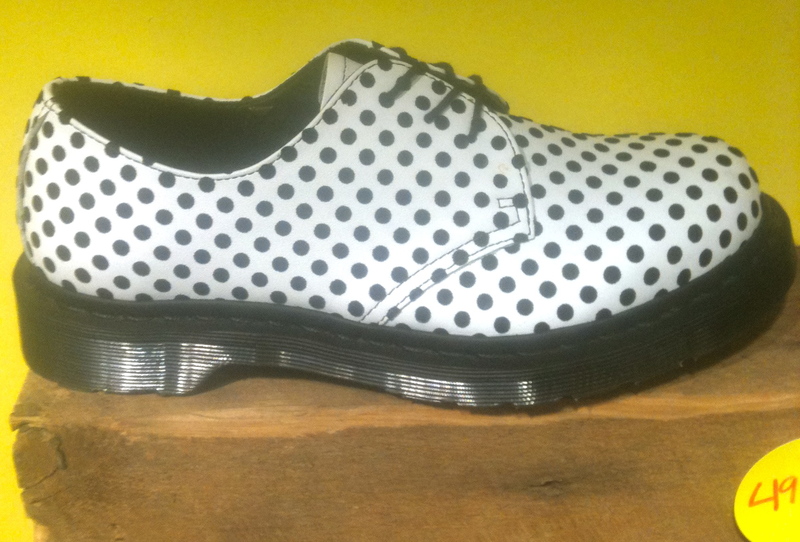 Here we have some black-and-white polka dots. 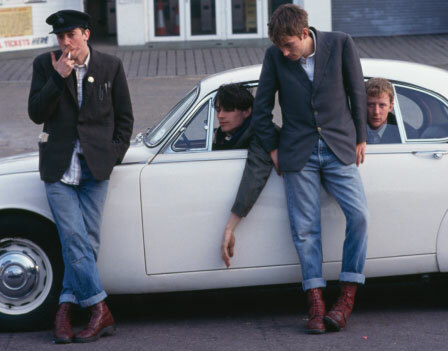 Bit of a mod vibe. Another polka dot style, but too aggressively pink for my taste. 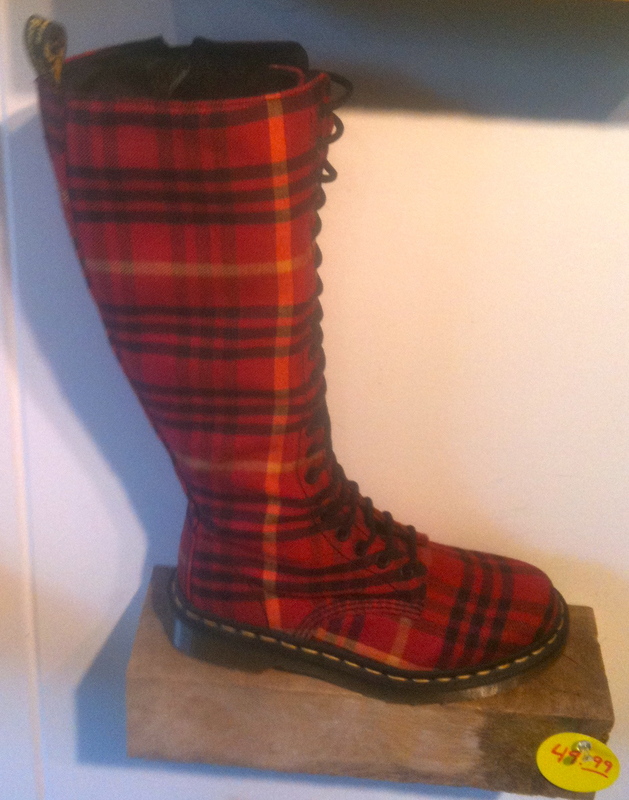 Ohhh….these tartan ones are awesome. Whatever your taste, there is no doubt something here for you. In the end, I spotted a pair of 12-hole black ones with gold grommet detailing. I laced them up, and was very pleased with the results. They weren’t exactly what I had in mind when I walked into the store, but they fulfilled my criteria of “classic” and “versatile” with the added bonus of some flashy metallic styling. So, if you see me stomping around town in my new boots, lemme know what you think! This entry was posted on Sunday, April 24th, 2011 at 6:04 pm	and posted in Spotlight on Style. You can follow any responses to this entry through the RSS 2.0 feed. 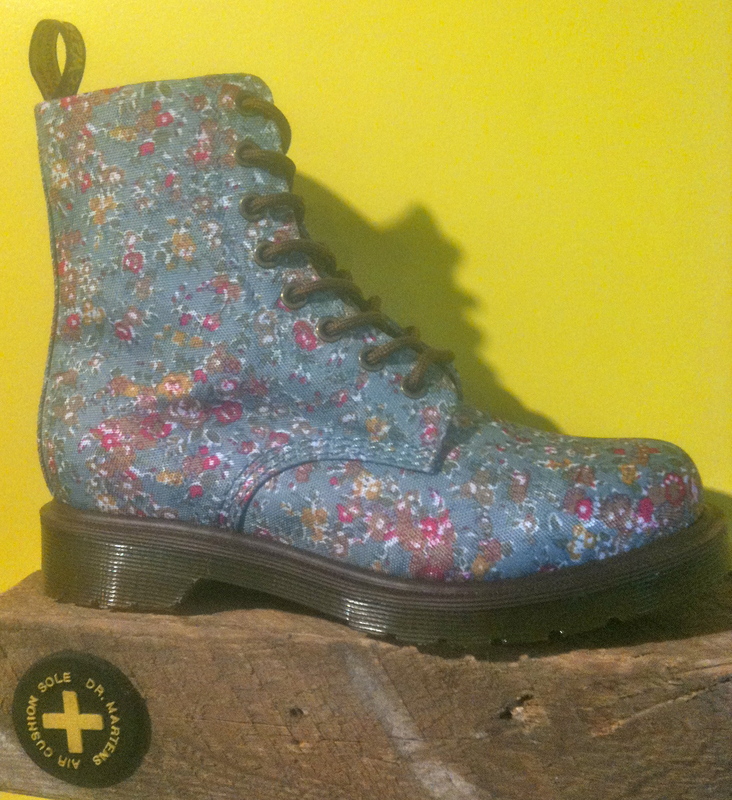 amazing…I`m on my 4th pair of Mr Martens. 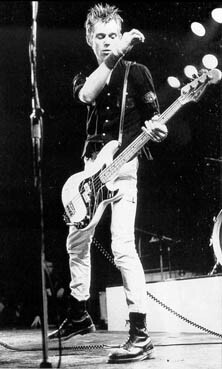 My first pair was a simple 3 hole black – too chicken to rock 8 holes in Oshawa in the 90’s. regretted my decision immediately. 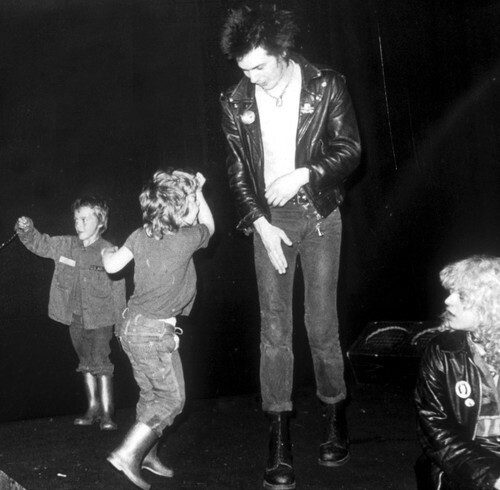 Man go did I feel lame… a long hair rocker with 3 hole Docs – pathetic, may as well of had boat shoes. 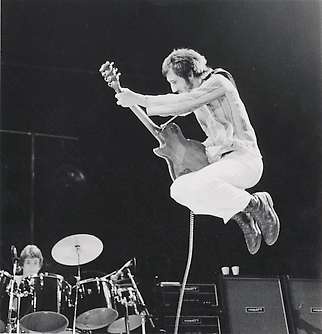 Not long after I purchased a pair of 8 holes in Oxford England – things felt right after that. I had a pair Brown 6hole with combat soles and just purchased another pair of 8 hole for my wedding!! I didn’t know Dr Marten was a skier – AMAZING!!! Boat shoes! lol. I love it. I can only imagine the ‘Shwa in the ’90s my friend. Good on you. p.s. thought you’d like it that he was a skier! Roused unexpectedly in a fraternity house late one night I was immediately overwhelmed by wave of nausea and was forced to grab the nearest possible receptacle. 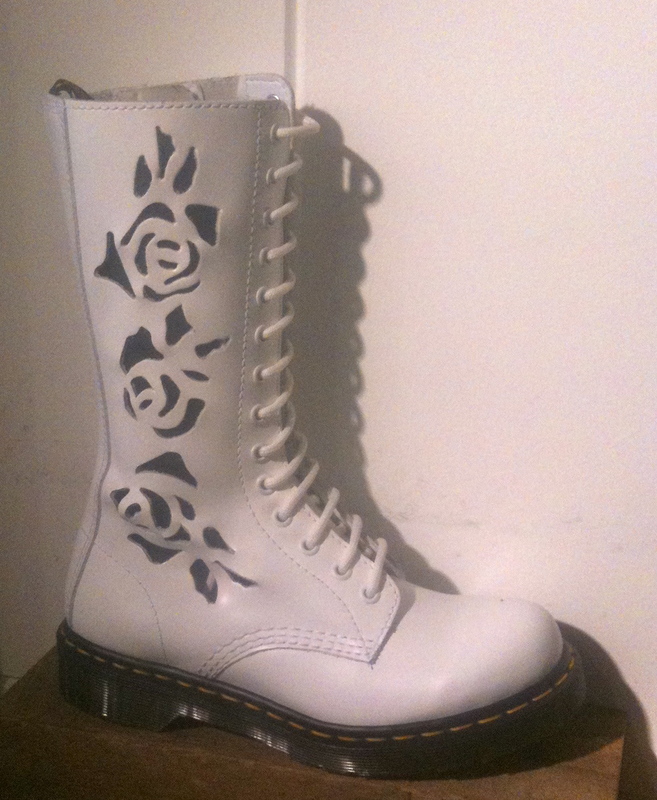 That was my Doc Marten. I emptied my ballasts, righted my ship, and thank goodness for that waterproof construction inside and out because I didn’t lose a drop. Is there anything they can’t do? ahahaha! great story. indeed, is there anything they can’t do? That absolutely sounds like something he would do. I love it.